Visio Online is definitely not a fully functional version of Visio for Mac users. However, it suffices as a Visio viewer for on macOS although you'll need a commercial Office 365 subscription to use it. Visio Online is Microsoft’s attempt to take some of the features and functionality of its popular diagramming software Visio and put them online. Visio Online replaced Visio Services for Sharepoint Online and goes a lot further than the former service. However, it’s important to be aware from the outset that it’s not a fully fledged version of Visio and certainly not as useful as one of these excellent replacements for Visio on Mac. In this review, we take a look at exactly what you can and can’t do with Microsoft Visio Online. 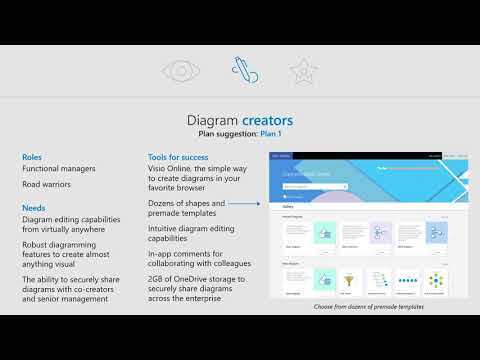 Visio Online was introduced by Microsoft in 2016 to make it easier for Visio users to share and edit Visio diagrams online. It also serves as an easier to use, stripped-down version of Visio for easy creation of diagrams such as flowcharts and org charts that’s comparable to many of the cloud diagramming tools that are available nowadays. The arrival of Visio Online was big news for Mac users in particular because there is no version of Visio for Mac and for the first time, it provided an easy way for Mac users to open Visio files on their Mac. However, the reality is that Visio Online is mainly a Visio viewer for Mac users because as we’ll see, for full editing of diagrams you need Visio Pro for Windows. Here’s a few things that Mac users need to be aware of before getting their hopes-up about Visio Online. Visio Online is intertwined with the desktop version of Microsoft Visio Pro – which is only available on Windows. Therefore, many of the crucial editing features that most people need to edit Visio diagrams simply don’t work on Mac. To actually edit a diagram, you have to click on the “Edit In Visio” option to open the desktop version of Visio for Windows as you can see below. Mac users can however use Visio Online to view Visio files in their browser (although you’ll need a commercial Office 365 subscription to use it – see more on Visio Online Pricing below). You can also add comments to diagrams as a Mac user although if there are multiple people viewing a document at the same time, you need to keep refreshing the document to see the comments. However, if you try to edit a diagram you’ll be prompted to open the diagram in Visio Pro to “use the full functionality of Microsoft Visio” – which of course isn’t available on Mac. Even if you want to do something as simple as edit the shape data of a network diagram, you can’t with Visio Online. Even on Windows, although several users can view a Visio file in Visio Online at the same time, only one person can work on it at a time. If someone is editing the document, other users can only use Read-Only mode or create a copy of the document. One of the problems however is that Visio Online doesn’t tell you when someone is editing the document. You’ll only know when you try to edit the document yourself and find that you’re locked out. The problem with this is that once someone else is editing, you are effectively “locked-out” of the document. You have to contact the person editing it to stop and allow you to take over. Another problem with that is that there’s no Revision History in Visio Online. So if someone makes lots of bad edits to the diagram, there’s no going back and nothing you can do to stop them. Finally, another problem is that in Read-Only mode, you have to keep refreshing the document to see changes that have been made to a diagram. You can’t see them being made in real-time. Another drawback is that you can’t actually tag other users that are collaborating on the document with @ mentions or hashtags. This makes it confusing sometimes regarding which comments refer to which users and can take longer in getting feedback from the right person. No Data Linking: The desktop version of Visio allows you to link to databases and other data sources to keep diagrams current and updates. This is not possible in Visio Online. Lack Of Shape & Stencil Libraries: Visio Online lacks the shape and stencil library you get in Visio. There’s also no way to import shapes or stencils from Visio. It Times Out Too Much: Visio Online times out after a couple of minutes of inactivity informing you that your session has expired. You can get back to where you were by refreshing diagrams but it’s very annoying. If you just want to view a Visio file, Visio Online opens VSD, VSDX and VSDM Visio files. It can also open VDW files but they have to be converted first. Alternatively, Windows users can select one of the many templates to create diagrams online and add their own shapes which they can then continue to edit in Visio Pro. There are multiple shape palettes including Venn, matrix and cycle diagrams. Manipulating shapes is the same as in Visio – you can simple pick them up, resize, rotate them and connect easily. Smart Lines help guide you with connecting lines, you can group and ungroup shapes and add text boxes or tables with extra information. You can find full details of what Visio Online can do here. Visio Online requires a commercial Office 365 Plan to use and is available in two plans – Visio Online Plan 1 & Plan 2. Visio Online Plan 1 allows creating and sharing of Visio files online for $5 per month per user but lacks integration with the desktop version of Visio for Windows. Visio Online Plan 2 includes integration with Visio Pro, Office 365 data and Power BI for $15 per month per user. Visio Online Plan 2 is in reality, the new name for Visio Pro for Office 365. Plan 2 also allows you to create diagrams directly from Excel using a Data Visualizer. Plan 2 also includes a Visio viewer for iPad and iPhone. There’s a full Visio Online FAQ by Microsoft which covers the most commonly asked questions. Mac users looking for an alternative to Visio Online can check out this list of Visio alternatives for Mac. The best we’ve tried is SmartDraw which is not only easier to use than Visio but is also the only tool on Mac to export to Visio VSDX format which can be opened in MS Visio on Windows. There are also alternative tools for viewing Visio files on Mac than Visio Online that don’t require a commercial Office 365 subscription. You can also run Microsoft Visio on Mac if you install Windows on your Mac using a virtualization software like Parallels although this is not an efficient solution in the long run.